George Katona was a behavioral economist and consumer researcher whose work laid the foundations for consumer confidence measurements. He was one of the leading voices in postwar mass consumption research in the United States. Katona was born in Hungary in 1901 and moved to Germany in 1919 where he earned his Ph.D. in experimental psychology from the University of Göttingen in 1921. Katona subsequently moved to Frankfurt and, in addition to his psychological research, he worked in the research department of a bank, where he gained a unique perspective on the hyperinflation of 1923. This experience formed the basis for Katona’s interest in behavioral economics. Katona’s thinking was further influenced by the Great Depression. He lived in Berlin during that period, working as a financial journalist for Der Deutsche Volkswirt and as an experimental psychologist with Gestalt psychology pioneer Max Wertheimer and social psychologist Kurt Lewin. Katona immigrated to the United States in 1933 and became an American citizen in 1939. Like his mentor Wertheimer, Kantona was for a time affiliated with the University in Exile at the New York New School and in 1944, he joined the Division of Program Surveys at the U.S. Department of Agriculture’s Bureau of Agricultural Economics, investigating the psychology of war economics. 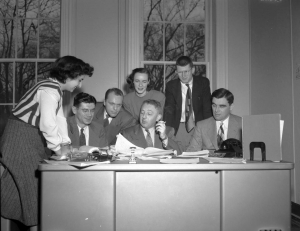 In 1946, he and his colleagues moved to the University of Michigan’s Survey Research Center, where Katona initiated and directed the Economic Behavior Program. Katona adapted his interest in the interplay of economics and psychology developed in interwar Europe to the context of postwar American mass consumption. He is known in particular for his contribution to the field of behavioral economics. Drawing on his background in economics and psychology, Katona developed the first consumer confidence indexes. His Economic Behavior Program developed the Survey of Consumer Finances for the Federal Reserve, which was conducted from 1946 ­­– 1971, and the Survey of Consumer Attitudes for the Department of Commerce, which is still in use today. These surveys asked representative samples of households about their views and expectations with regard to their own finances and the state of the economy as a whole. Building on this data, Katona calculated an index that aimed to predict consumer behavior. Published monthly since 1952, this Index of Consumer Sentiment is included in the U. S. Department of Commerce’s Leading Indicator Composite Index. Katona’s work analyzed consumers’ decision making processes, which had previously been a “black box” to economists. His research focused primarily on: 1.) the information and perceptions consumers employ; 2.) the desires and goals of consumers; and 3.) the social norms and expectations that guide consumer behavior. His central insight, as argued in his 1951 Psychological Analysis of Economic Behavior, was that in affluent societies, attitudes and expectations - rather than physical needs or income - determine household patterns of saving, spending, or credit use. Consumers, he emphasized, could not be treated as rational actors because they were imperfectly informed and often acted on impulse. Katona’s research not only became influential for interpreting American mass consumption patterns, but was also employed as a yardstick for the European adaptation to abundance during the economic boom era of the 1950s to early 1970s. While he became a champion of America’s postwar consumer society, Katona remained very interested in European consumption patterns. He collaborated with European colleagues in implementing his research agenda on both sides of the Atlantic. In 1971, George Katona, Burkhart Strümpel, and Ernest Zahn published Aspirations and Affluence: Comparative Studies in the United States and Western Europe. This transatlantic study was a landmark in comparative consumer research. Consumers in America, Katona and his European collaborators found, exhibited different reactions to the long period of postwar affluence than consumers in Europe. While both the United States and Europe had seen a tremendous increase in the material standard of living, households adapted to affluence differently both in their expectations and spending patterns. The researchers found that West German consumers tended to be more pessimistic than their American counterparts about the prospects of economic development in general and their own personal prospects in particular. Unlike in the United States, in Germany the acquisition of goods was not a big priority for consumers. The techniques that Katona developed were eventually transferred to Europe. Prior to the 1970s, no consistent measure of consumer confidence in Europe existed. Since 1972, a consumer sentiment survey based on Katona’s methodology has been used by the European Commission. Katona, George. The Powerful Consumer: Psychological Studies of the American Economy. New York: McGraw-Hill, 1960. Katona, George. Psychological Analysis of Economic Behavior. New York: McGraw-Hill, 1951. Katona, George, Burkhard Strumpel, and Ernest Zahn. Aspirations and Affluence: Comparative Studies in the United States and Western Europe. New York: McGraw-Hill, 1971. Katona, George, and Eva Mueller. Consumer Attitudes and Demand, 1950-1952. Ann Arbor: Survey Research Center, Institute for Social Research, University of Michigan, 1953. Curtin, Richard. "Curtin on Katona" in Henry Spiegel and Warren Samuels (eds. ), Contemporary Economists in Perspective. Greenwich: JAI Press, 1984: 495-522. Horowitz, Daniel. The Anxieties of Affluence: Critiques of American Consumer Culture, 1939-1979. Amherst: University of Massachusetts Press, 2004. Strumpel, Burkhard, James Morgan, and Earnest Zahn et al. (eds.). Human Behavior in Economic Affairs: Essays in Honor of George Katona. San Francisco, 1972. George Katona Papers, Bentley Historical Library, University of Michigan, Ann Arbor, MI.